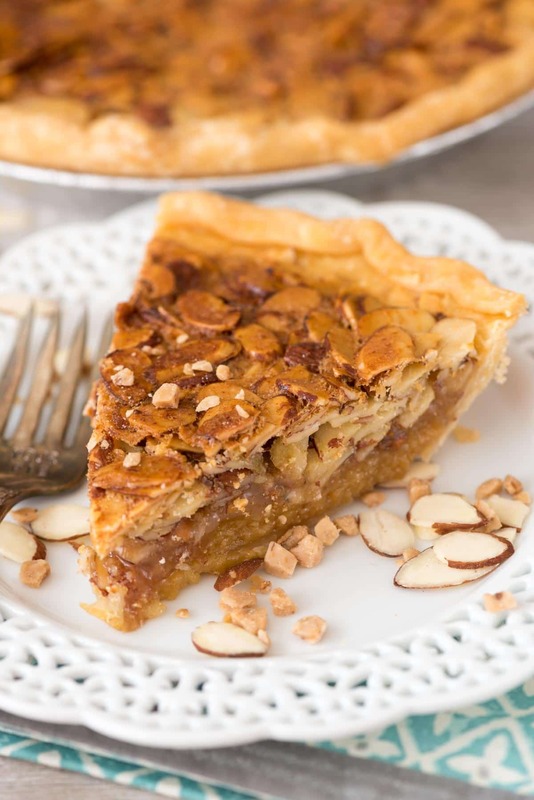 Toffee Almond Pie – an EASY pie recipe filled with toffee and almonds. It’s like a pecan pie, but with almonds! I couldn’t stop eating it, for reals. Say hi to your new favorite holiday pie recipe! Driving to the video store and browsing to find the perfect Friday night DVD. Having to watch all the commercials. What a “tape” is (either VCR or cassette). How to memorize a phone number. Also, since she’s my daughter, she’s not going to know how to cook, how to have only monkey bread OR cinnamon rolls at Christmas, or how to eat store-bought cookies. Or store-bought any dessert, that is. Most kids look forward to Walmart cupcakes and pies from Costco…not my daughter. She eats them “to be polite” but tells me later that mine are way better. So, no matter how much I feel like buying store-bought anything for the holidays, I know I have to make stuff from scratch. Cookies, candy, pie…it’s all me people. So if I’m making it anyway, I may as well tinker with the original recipes, right? I hope you just said yes to that question, because this pie is one of the best tinkering I’ve done in awhile: I turned pecan pie into toffee almond pie! We all love pecan pie, right? It’s crunchy and sweet and gooey and perfect, but I got to thinking: why do pecans have all the fun? Several years ago I gave macadamia nuts a whirl and loved that pie so hard I decided to make yet another version. This pecan pie is actually an ALMOND pie, with toffee bits. Instead of dark corn syrup, I used light. Instead of pecans I used slivered almonds. And then I added toffee bits. The result? PURE HEAVEN. Crunchy and creamy and perfectly sweet, toffee almond pie is my new favorite pie recipe. Move over pecan pie…you have a competitor in the neighborhood. There are so many versions I can think of for this pie recipe. I’ve got another one coming up soon. In the mean time, make, bake, then devour toffee almond pie! 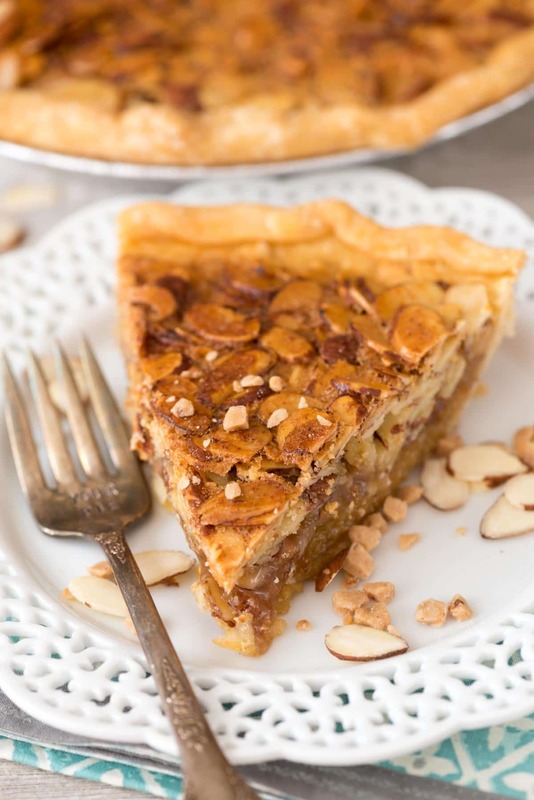 Toffee Almond Pie - an EASY pie recipe filled with toffee and almonds. It's like a pecan pie but with almonds! 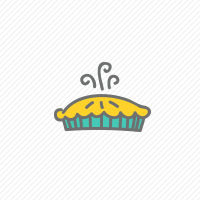 Everyone loves this pie. Place pie crust in a 9” pie plate and decorate the edges as desired. Chill until ready to fill. Whisk eggs, sugar, corn syrup, melted butter, salt, and cornstarch until smooth and combined. Place the pie on a cookie sheet (in case of spillage). Cover the outer edges of the crust with a pie crust shield or strips of foil. Bake for 10 minutes at 425°F, then lower the temp to 350°F and bake for an additional 50-60 minutes, or until the almonds are very toasted and the pie is just a bit jiggly in the center. It will set as it cools. Cool completely before slicing. Toffee bits. almond-y goodness. Oh gosh..oh man…this pie. I need it. PINNING. Also-here’s hoping my kids have the same problem Jordan does ;P And I LOVE Breakfast Club! Can you make this the day before and refrigerate? What brand of toffee bits do you use? I made it and LOVE IT, but did so without the toffee because I couldn’t find any. Hi Dorothy! I was looking for pecan less pecan pie. I loved it as a child but was sick one Thanksgiving & begged for a piece. I was afraid I wouldn’t like it cause I was sick. I ate a bite & got sick. Pecans have made me sick ever since then. BUT I love almonds! I’m so happy you have this recipe & for the first time at 53 years young I get my pie! Thank you!